A place of myth, mystery, and horror, Parco dei Mostri was designed not to please, but to astonish. The park’s name stems from its many larger-than-life sculptures, which appear to be have been randomly strewn about the area. The symbolism of these Mannerist works of art is obscure, with figures of a turtle with a winged woman on its back, a huge elephant trampling a Roman legionary, and a dragon attacked by lions, to name just a few of the oddest examples. The layout of the lush garden, created in the 16th century, is attributed to architect Pirro Ligorio, and the sculptures to artist Simone Moschino. The garden, still a private property, has been a major tourist attraction since the 1970s. Tickets can be purchased at the entrance. For Parco dei Mostri and beyond, use our Bomarzo holiday site to get the most from your Bomarzo vacation. Definitely worth visiting, magical place and with a great story not described precisely by poor map that leave you at the entrance, where you wrongly, because the person €10 parade Park is confusing, not even an indication or explanation under the sculptures ... not one, no, you don't understand anything, people who wander without figuring out what to see and where to go ... you have to ask yourself ... Art wasted in the hands of an uncaring and incompetent Manager that devalues the Park. Too bad. After months we wanted to come and visit the Park finally we get the chance. The place is awesome (although the weather was not the best), and the statues are magnificent. Unfortunately do not have explanation, then they can only be admired. (But given the map at the entrance!). of course I recommend it to everyone! A curious walk in a park outside the box. A series of megalithic sculptures representatives mythological figures, houses, temples, fountains, animals and whatnot. Who knows what the customer had problems in doing so realize. Still enjoyable. Mass tourism. Parking no problem. Admission fee. Restaurant and Café on site. If you are in the area, you MUST visit the Monster Park! It was so interesting to wander through this collection of sculptures and structures of the Orsini family. I spent the entire time in awe. It is a bit of a guessing game when you are trying to match a sculpture to the descriptions because the map is not to scale, but you’ll still figure it out quickly. My only suggestion is that you visit during a cool season or on days that are not terribly hot. While you are covered by trees, there isn’t a great breeze blowing, so you can get very hot quickly. Other than that, this is a great place to visit! It could be a dream! This place is so intense and and magic, it offers an escape from the everyday life. The handmade sculptures are just amazing! I've never seen any place like this one. I would really recommend to visit the Mostri Park and enjoy the nature with a nice wall around the park. You may find a bar and a souvenir shop at the entrance, also a picnic spot where you may have a packed lunch immerse in the peace of the nature and enjoy the silence. Price quality does not match. The price of a child's ticket is expensive. In the park there are fine stone sculptures and beautiful nature. The park where you can enjoy a longer stay. It is worth taking your own lunches. In the shady area of ​​Picnik. For children a small play area. Free big parking area. Clean toilet facilities. A one of a kind park for with an Indiana-Jones feel. When visiting Viterbo it's a must adventure! Good for families and friends. They have a picnic area amidst the weirdly unique sculptures! Nice park that's in a shade all over which helped a lot on a day that we had 30+ degrees. Has a bar, toilets, friendly staff, a lot of info available. Worth a visit, especially with kids. Just read a story about it before you enter, everything will make more sense. Every day, we help thousands of travelers plan great vacations. Here are some tips on how to use your Listing Page to attract more travelers to your business - Parco dei Mostri. 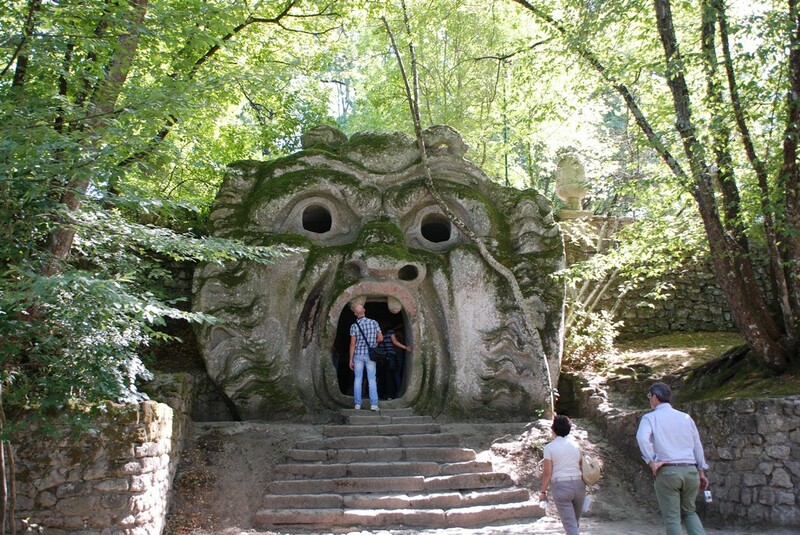 Promote your permanent link - https://www.inspirock.com/italy/bomarzo/parco-dei-mostri-a19220093 - on your website, your blog, and social media. When a traveler builds a plan from this page, the itinerary automatically includes Parco dei Mostri. This is a great way for travelers looking for a great vacation in your city or country to also experience Parco dei Mostri. Promoting your link also lets your audience know that you are featured on a rapidly growing travel site. In addition, the more this page is used, the more we will promote Parco dei Mostri to other Inspirock users. For best results, use the customized Trip Planning Widget for Parco dei Mostri on your website. It has all the advantages mentioned above, plus users to your site can conveniently access it directly on your site. Visitors to your site will appreciate you offering them help with planning their vacation. Setting this up takes just a few minutes - Click here for instructions.